inSpirit seeks to do things differently – simply being a church built on fulfilling “The Great Commandment” and “The Great Commission” by establishing an Acts 2 church that meets people where they are at today. A DIVERSE COMMUNITY of Christ followers who ACCEPT, LOVE, and ENCOURAGE one another to GROW in our faith and SERVE God and our neighbor. REACH OUT to all people, regardless of race, color, or socio-economic levels, by Accepting, Loving, and Encouraging each other to Grow in faith in God and Serve by being the hands and feet of Jesus to all those around us. We value a safe, accessible place to be together with family, friends, and neighbors. We value praising, praying, and proclaiming the truths of the Bible with joy and excitement. We value learning about Christ so that we can become more like him and more excited about leading others to him. We value the gifts we've been blessed with and pledge to use them by serving our Lord, each other, and our neighbor. We value serving our Lord by being His hands and feet to all those around us. Jesus Christ is God’s one and only Son, who died on a cross and arose victoriously from the grave conquering sin and death. 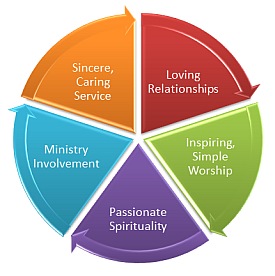 The Holy Spirit lives within every believer empowering them to live a life of service. The Bible is the Holy inspired Word of God and is our guide and final authority for all matters of faith and life. Every person has value as a creation of God, but that all of us have sinned and fall short of God’s glory. Salvation - forgiveness of sins and eternal life - is available to all who trust in Jesus Christ as Savior and Lord and that those who accept him must repent, profess their faith, and grow to become more like Christ. The church is the body of Christ, God’s family of faith on earth, empowered by the Holy Spirit to invite the lost to a relationship with Jesus and to equip and build up the saved.